Fireworks are not loved by everyone! The excitement and fun of fireworks in November is not that far off. And it seems now that the season of fireworks runs from Bonfire Night through to New Year, but many of pet owners are not keen. If you’ve a pet that is terrified by the scary noises and smells of fireworks you are not alone. Some pets really suffer and there’s lots we can do to help them cope well. Fireworks can be extremely stressful for your pet. Many are affected by the loud bangs and strange smells. Dogs and cats may run, hide, tremble, refuse to eat or even try to escape to help themselves cope. Preparing early can make a big difference and we recommend you start to make plans in early October: Here are some of the things you can consider doing to help. Build your dog a den – if your dog already has a safe place they run to when they are anxious, then build the den there. Otherwise build it in a snug area and cover it with blankets and bedding. If you have a cat, build them a safe place, somewhere they like to go up high and nice and warm. 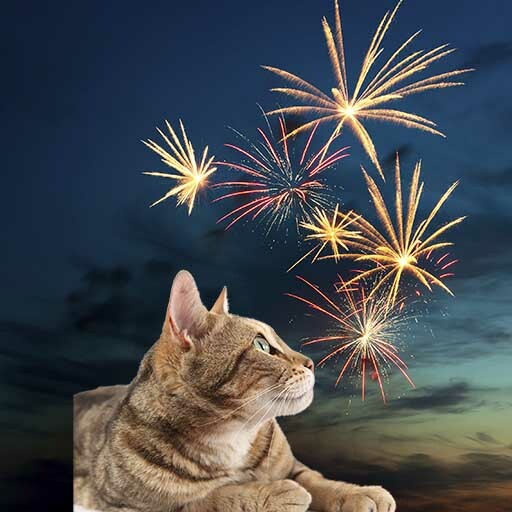 We recommend using a FELIWAY or ADAPTIL diffuser – plug this in 2 weeks before you expect the fireworks, this will create a calm atmosphere before the fireworks begin. Keep these plugged in until after New Year. Make sure your dog or cat is wearing a tag or is microchipped in case they run away. We’ve a special offer running on Adaptil for dogs and Feliway for cats which might be of interest. Contact us for more information or pop into our Hospital’s shop when you have a moment.